CD122 signaling supports costimulation-independent recall responses. 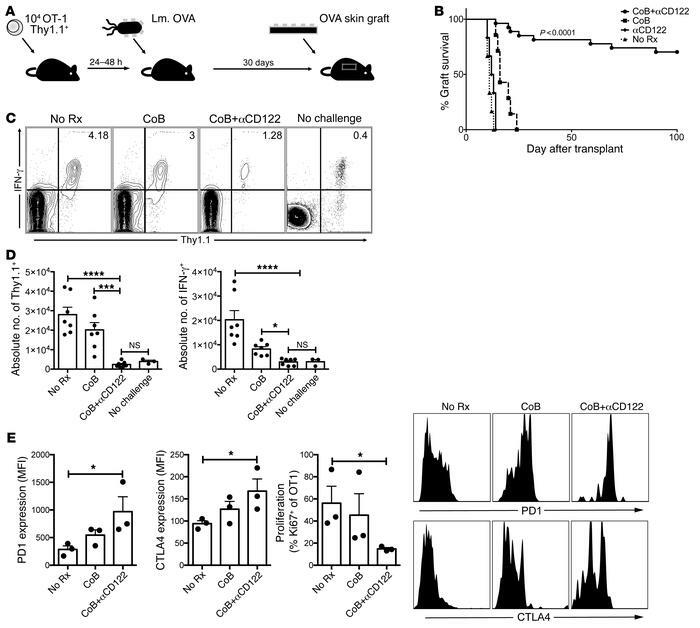 (A) In a model of memory CD8+ T cell–mediated graft rejection, OVA-specific CD8+ T cells (Thy1.1+OT-1) were transferred into naive C57BL/6 mice. Mice were immunized 24–48 hours later with Listeria monocytogenes expressing ovalbumin (Lm.OVA). After 30 days, mice were challenged with an OVA-expressing skin graft. (B) Untreated mice experienced rapid acute rejection (black triangles, No Rx, MST = 11). Mice treated with αCD122 rejected their skin grafts with similar kinetics to untreated mice (black diamonds, αCD122, MST = 13). CoB treated mice experienced memory CD8+ T cell mediated costimulation independent rejection shortly after (black squares, CoB, MST=16). Addition of αCD122 synergized with CoB to prolong graft survival indefinitely (black circles, CoB+αCD122, MST > 100 days, n = 6–13/group, P < 0.0001 Mantel-Cox log-rank test). (C) We investigated the impact of CoB+αCD122 by examining the frequency and function of graft specific CD8+ T cells in the draining lymph nodes 5 days after transplantation. Addition of αCD122 constrains the expansion of graft specific CD8+ T cells as demonstrated in representative FACS plots. (D) Both absolute number of graft specific (Thy1.1+) cells (P < 0.0001) and IFN-γ+ cells (P < 0.0001) were diminished with the addition of αCD122. (E) CoB+αCD122 therapy resulted in increased coinhibitory receptor expression on remaining graft specific CD8+ T cells. Thy1.1+ cells demonstrated increased PD-1 (P = 0.0303) and CTLA4 (P = 0.0065) expression. Additionally, decreased Ki67 expression (P = 0.0250) indicated reduced cell-cycle entry. (C–E) P values were generated by 1-way ANOVA followed by Bonferroni’s multiple comparisons test. Bars represent the mean ± SEM of 3–7 mice per group. Results are representative of 5 independent experiments. *P < 0.05; ***P < 0.001; ****P < 0.0001.